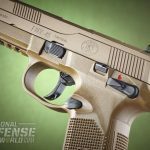 Packing 15+1 rounds of .45 ACP firepower, the FNX-45 Tactical is ready right out of the box, and users can add mission-critical gear, such as the SureFire X400 shown, with ease. 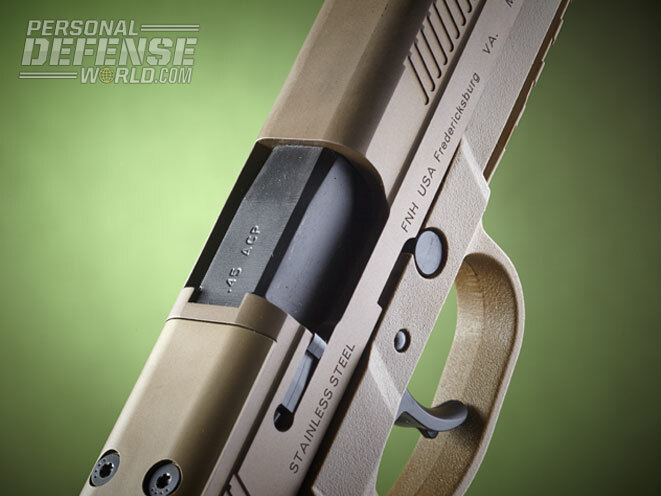 The FNX-45 Tactical’s ambidextrous safety/decocker facilitates both traditional DA/SA use as well as cocked-and-locked SA carry. 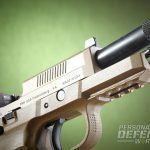 Living up to its “Tactical” name, the pistol’s 5.3-inch barrel features 1/2×28 threading for mounting sound suppressors, and FNH USA includes a thread protector. 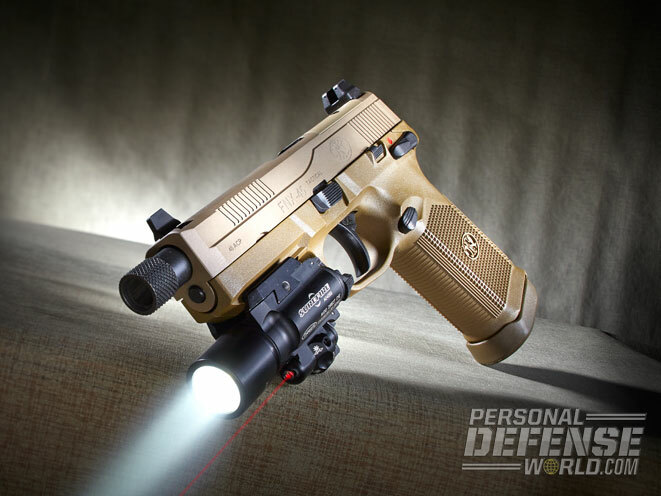 FN equips the FNX-45 Tactical pistol with an accessory rail for adding lasers and lights, such as the SureFire X400. Checkering on the sides and back of the grip, combined with serrations on the frontstrap, provide plenty of traction and control. 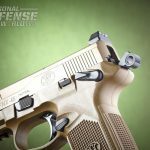 The front and rear three-dot sights are taller to accommodate a suppressor and co-witness with reflex sights. My first opportunity to shoot the FNP-45 Tactical pistol was during a Gunsite 250 Pistol class. During the night-fire portion of the class, one of the instructors brought out his personal FNP-45 Tactical. Fully equipped with a Trijicon RMR reflex sight and a SureFire X300 light, it was about as “tactical” as it gets. It was also my first time using a reflex sight on a pistol, and it piqued my interest. It was accurate, well balanced and easy to control with very little recoil. Of course, I had to further investigate using reflex sights on handguns. 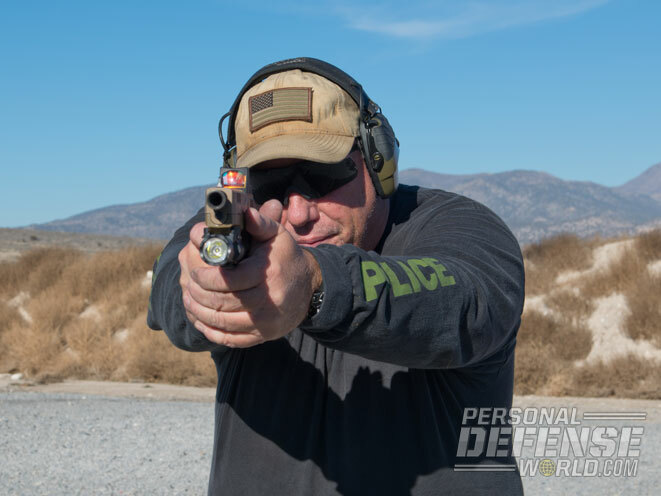 This particular pistol was fast, accurate and, over time, using the sight became intuitive. It was also a real asset in low light. The Gunsite instructor was Walt Wilkinson, and that gun has turned into his primary .45 ACP pistol. Walt has an impressive background with years of combat experience, which adds even more weight to his opinion. 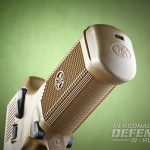 I’ve also carried and deployed full-sized .45 ACP pistols for decades, so we share many opinions on the caliber, and I am always looking for a high-capacity model that works well and does not weigh a ton. Having carried single-action (SA) pistols for years, they remain my preference. Striker-fired weapons are certainly fine, but I like a pistol with a hammer, a thumb safety and a crisp SA trigger. Although its basic design is a double-action/single-action (DA/SA) pistol, the FNP-45 Tactical was built to accommodate cocked-and-locked SA carry. The FNP-45’s threaded barrel, accessory rail and reflex sight mounting slot all added to its appeal. 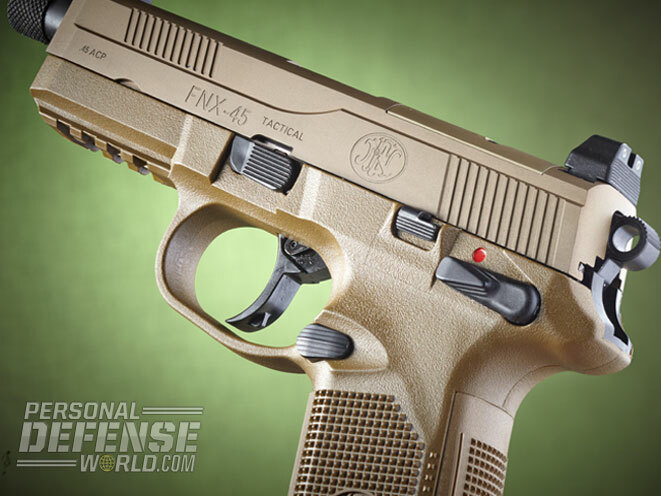 Now, FNH USA is offering an updated version, the FNX-45 Tactical. 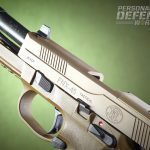 The FNX-45 Tactical pistol is based on the FNP-45, which was originally developed for the U.S. military’s Joint Combat Pistol (JCP) program that set out to replace the current M9 pistol. The original solicitation called for a .45 ACP pistol with a Picatinny accessory rail, night sights and a threaded barrel for adding a sound suppressor, and companies had to be capable of delivering 645,000 guns. Later, the program’s focus was geared toward special operations, and the pistol count was lowered to 50,000. The program was suspended in 2006 and changed to a “study,” encouraging manufacturers to continue experimentation. 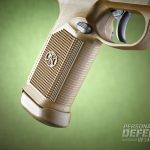 It has driven a number of pistol designs over the last few years from nearly a dozen manufacturers. If such a contract were ever truly awarded, it would be large and lucrative, thus encouraging companies to continue development. 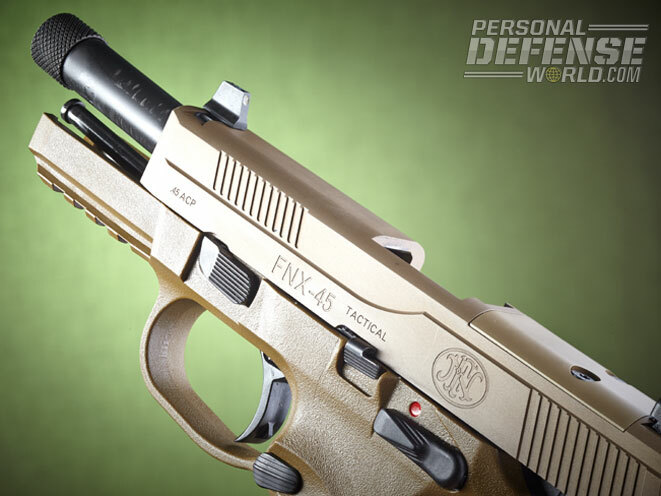 The FNX-45 Tactical utilizes all of the updates from FN’s FNX line. 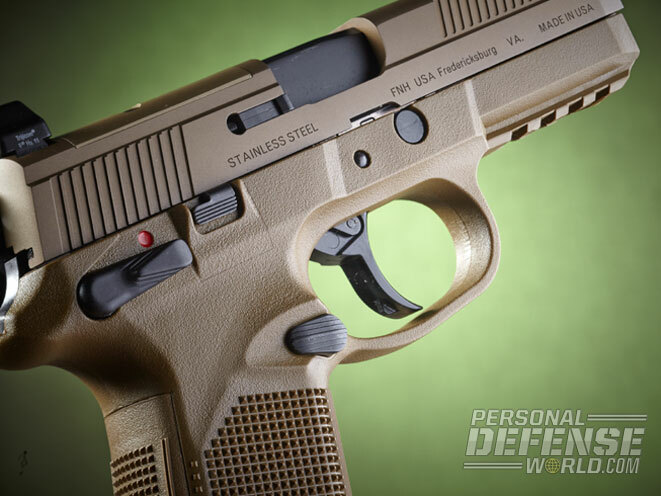 Introduced in 2009, FNX pistols maintain many of the requirements from the JCP program. They are DA/SA pistols with exposed hammers. All of the controls are ambidextrous, including the magazine release. Their polymer frames come with interchangeable backstraps to accommodate various hand sizes. The grips are aggressively checkered for control, and the dust cover features a Picatinny rail for attaching lights and lasers. 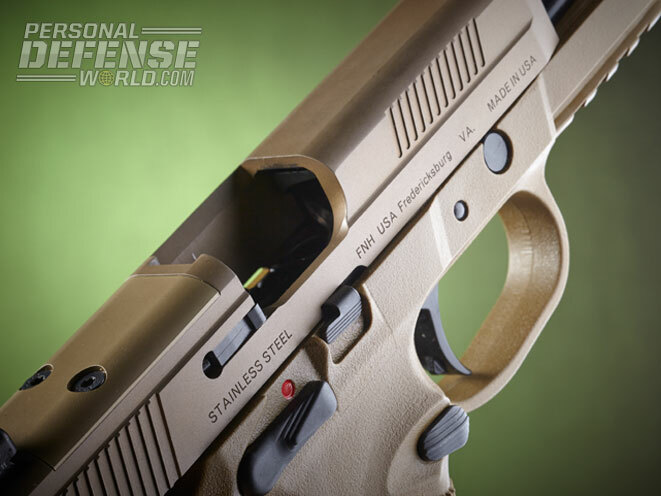 FNX pistols also utilize steel, double-stack magazines that offer high capacities in every caliber. Within the frame, the steel rails the slide rides on are replaceable, ensuring a long service life. 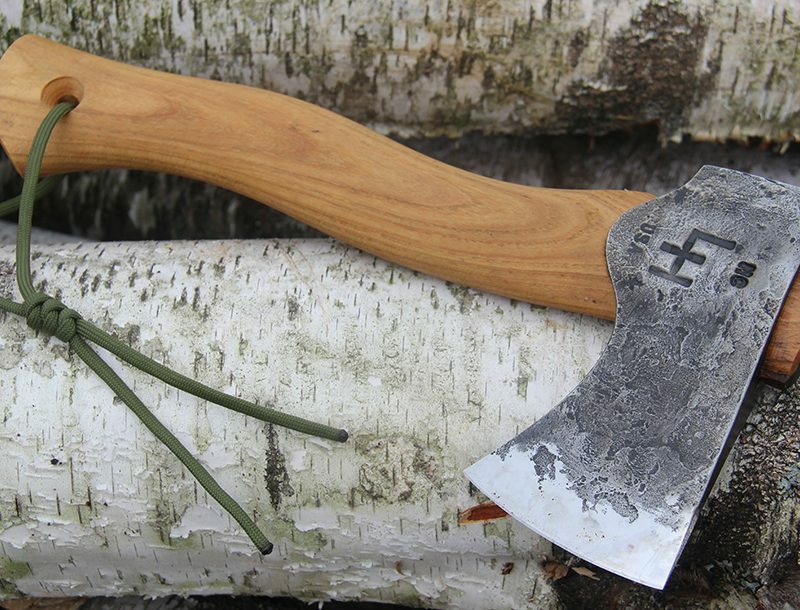 The barrels are cold-hammer forged, while the chambers and feed ramps are polished. The slides are made of stainless steel and include front and rear cocking serrations. The external extractor includes a loaded-chamber indicator. 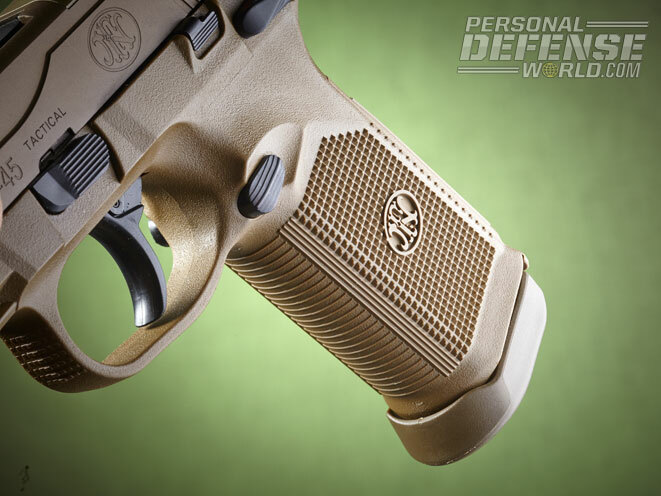 Chambered in .45 ACP, the FNX-45 Tactical includes a cut in the slide to accept miniature reflex sights. 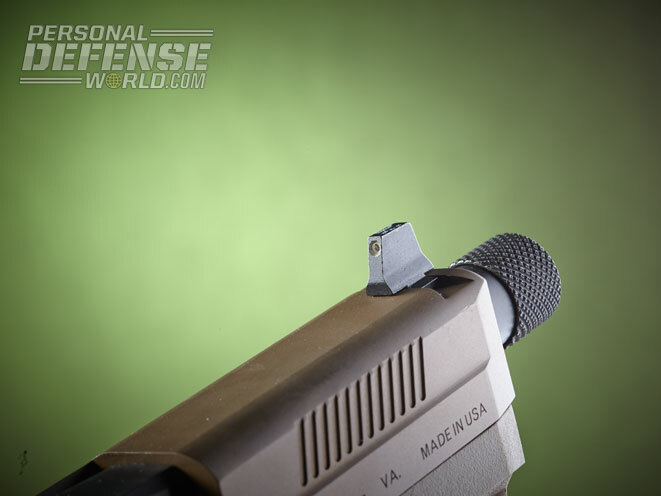 This cut allows for co-witnessing the fixed, three-dot iron sights with most reflex sights. 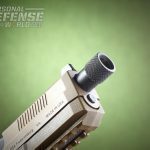 The 5.3-inch, cold-hammer-forged barrel also sports 1/2×28 threading to accept most sound suppressors. A thread protector is also provided. 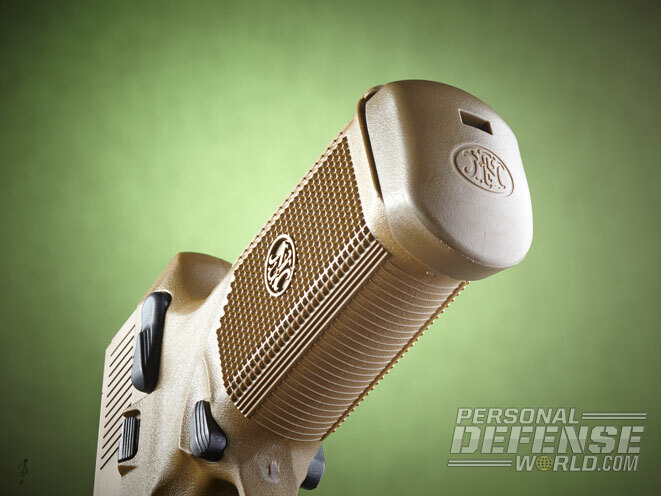 The FNX-45 Tactical’s ring-style external hammer, working with the thumb safety/decocker, facilitates cocked-and-locked carry. 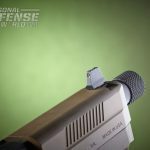 The three-dot, tritium sights have been raised for use with a suppressor. Finally, three 15-round magazines are provided as well as the hardware necessary for mounting the mini reflex sight. 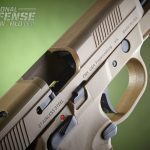 Available in black or Flat Dark Earth—my test model was the latter—FNX-45 Tactical pistols come in a nylon case that accommodates all of the accessories, including a sound suppressor. For testing, I mounted a Trijicon RMR on top of the slide. As mentioned, everything needed for the installation was included, making it quick and easy. 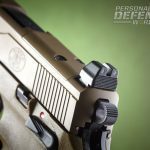 While other sights can be used, the RMR seems to be the favorite among those equipping their pistols with reflex sights. 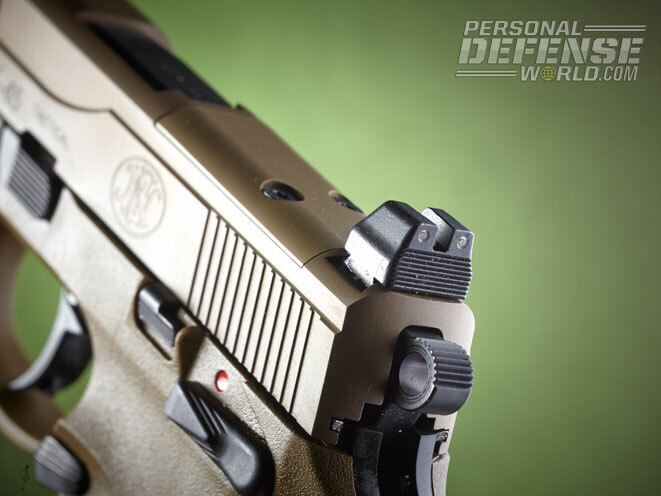 This RMR features a 6.5-MOA dot for aiming. I also mounted my SureFire X300 Ultra tactical light with a DG switch. This switch replaces the standard battery cap on the X300, providing a tape switch that sits under the triggerguard. This allows you to maintain a two-handed grip while using the light. It takes some getting used to, but with practice it has proven to be incredibly efficient. 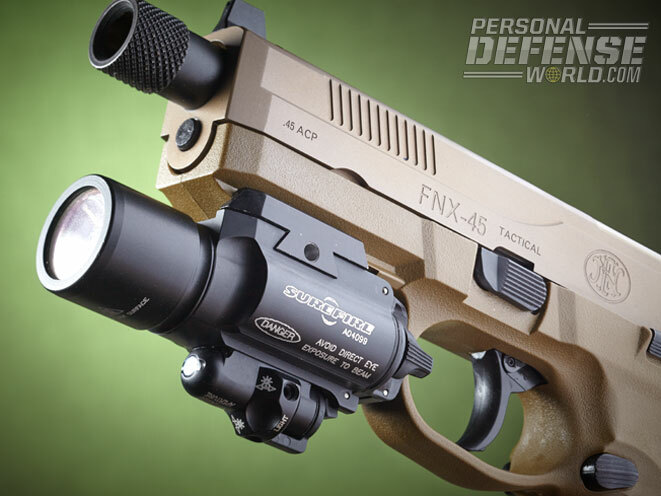 Whether working in a tactical environment or as a home-defense light, it is excellent. The hard part of the test was getting a holster. 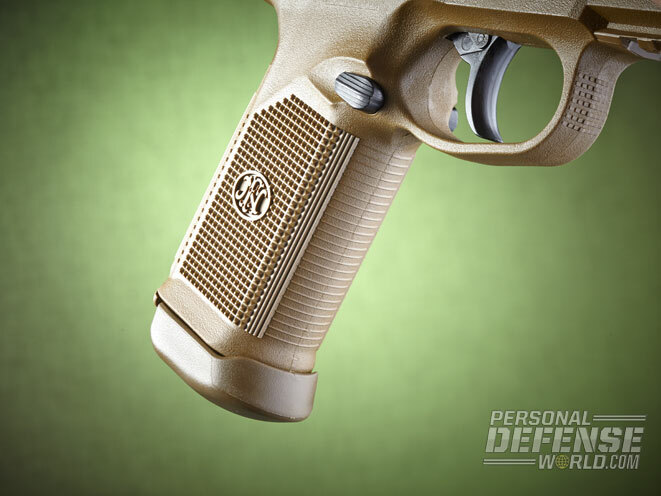 Luckily, NSR Tactical came to the rescue with one of its excellent Kydex holsters. 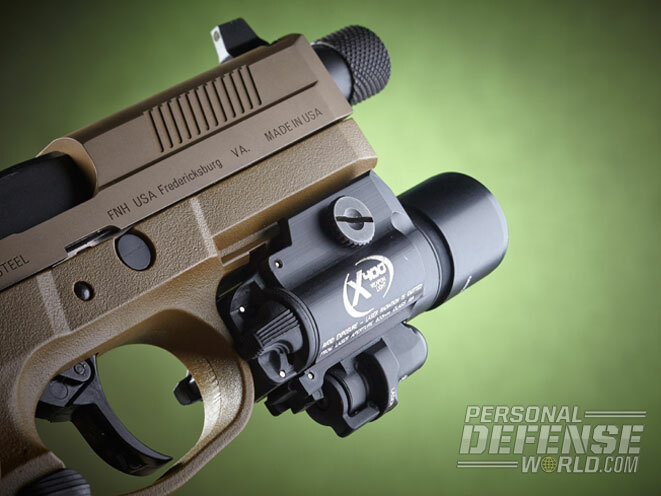 The Extended Light Holster (ELH) can accommodate big pistols with lights, yet it remains contoured to your body. While not a pistol you would generally “conceal,” the FNX-45 Tactical was very comfortable to carry in this holster with the RMR attached. 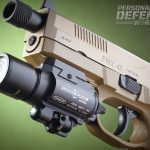 Having tested FNX pistols in several calibers, I consider them some of the softest-shooting pistols on the market. 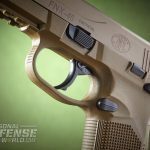 Many polymer pistols in .45 ACP can be pretty snappy, but that was not the case with the FNX-45 Tactical. Loaded with 15 rounds, it is no lightweight, but recoil is almost pleasant. Since the FNX-45 Tactical is designed for cocked-and-locked carry, I tested the gun in SA mode. With every type of ammo, its accuracy was excellent. Federal’s Tactical HST ended up with the best group at about 1.75 inches while using sandbags and a rest. All groups were under 3 inches, with most hovering around 2.5 inches. Moving to 15 yards and shooting off-hand, the pistol remained very accurate with the same Federal HST load, making one ever-growing hole through 15 rounds. Operating out of the NSR Tactical holster, the FNX-45 Tactical was pretty quick to draw, even with the light attached. 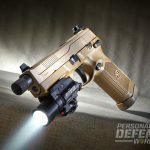 Carry pistols with tactical lights are becoming more common. Given the correct holster, it is plenty comfortable, although a bit more thought must go into concealment. The DA trigger pull is also pretty smooth; it’s one of the best first-round trigger pulls out there. In SA mode, it is very similar to a standard 1911 pistol. The reset is short, with a trigger pull in the 4.5- to 5-pound range. 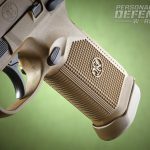 The take-up is about right for a combat pistol. Drawing on several targets, I never inadvertently activated the safety/decocker. Carrying this pistol in Condition One all the time would present no issues for most. All of the controls on this pistol are ambidextrous, and you can reach them without altering your grip. This made malfunction drills and reloads fast and smooth using either hand. Much of my training these days includes off-hand shooting, reloading and clearance drills. 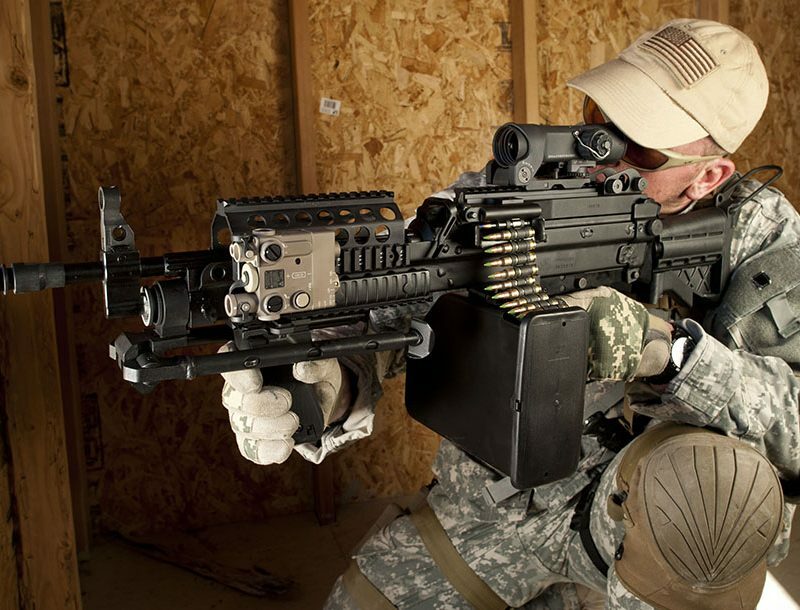 The safety and slide stop can be accessed easily with either hand, and the magazine release works nicely. Engaging with the reflex sight was quite fast and became more intuitive with time. Having the standard sights to co-witness is a huge help. Most long-time shooters are accustomed to finding the front sight first. 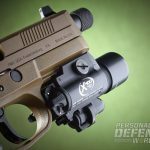 Without altering my proven presentation, the reflex sight came up just after the front sight, making multiple-target drills fast and accurate, and longer-range shots almost easy. 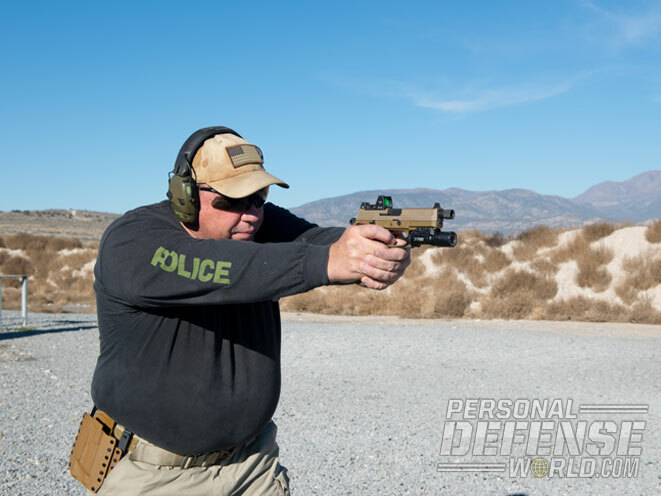 Zeroing the RMR at 25 yards, it made center-mass hits fast and controlled shots much easier. 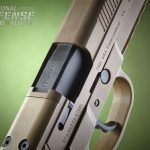 While this pistol could certainly be carried all the time, its sweet spot remains as a tactical pistol or home-defense gun. Soft shooting and accurate, it is still full-sized, especially with a light and a reflex sight. 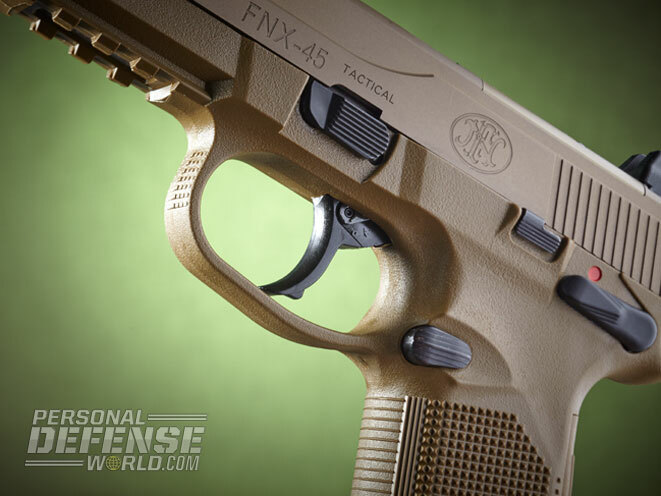 The FNX-45 Tactical is excellent for moving through tight hallways to defend your home, or as part of a tactical team. 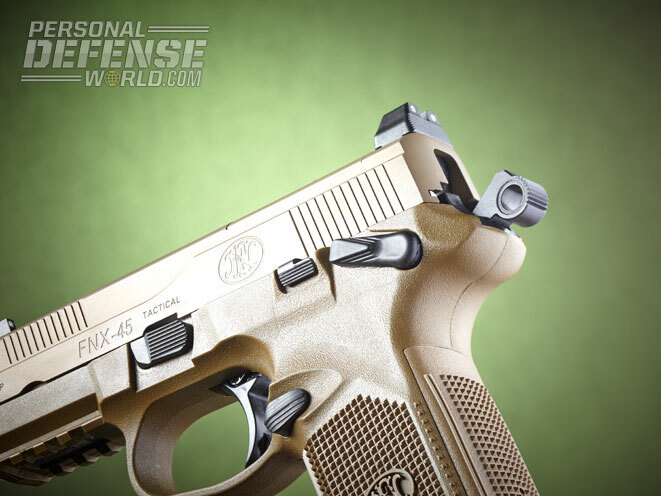 With practice, using a reflex sight on a pistol is addictive, and the FNX-45 Tactical makes it pretty easy. 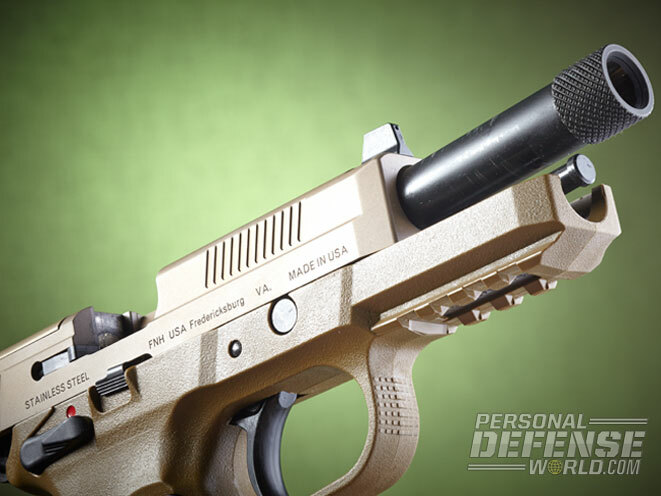 With 15+1 rounds of .45 ACP on tap, you’ll rarely be outgunned. Fully loaded, it weighs about the same as an all-steel 1911. The controls will also accommodate just about anyone. 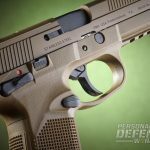 It is pretty easy to see why the FNX-45 remains popular among special operations types, as it is about as versatile as you can make a pistol. With no pistol suppressors in my inventory, that aspect of the pistol remained untested, but having fired a friend’s, it is a ton of fun. 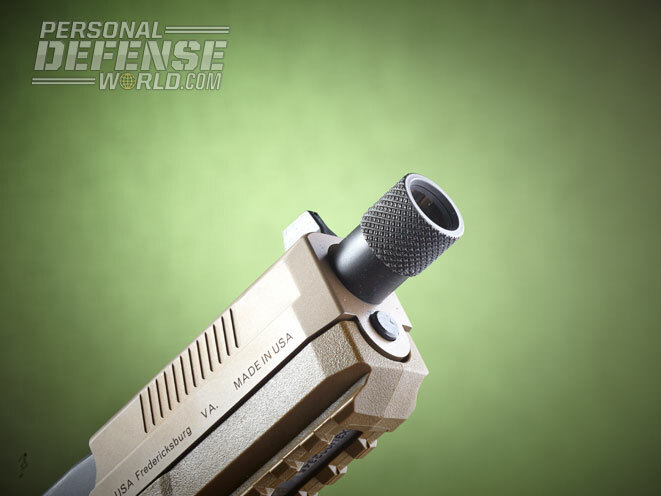 Practical suppressor uses are minimal, but having the capability is certainly advantageous. Even without it you get what amounts to a 5.5-inch barrel, making it perfect for competitions. The going rate for these is about a grand, and you get a ton of pistol for that price tag. All said and done, I find myself wanting one of these. It is just a great pistol. 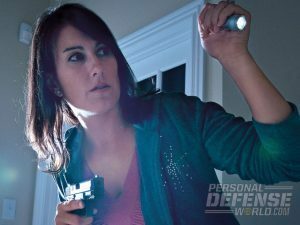 Tactical flashlights complete any capable close-quarters CCW kit!